For tool storage I have a plastic briefcase style tool box that has been around the world and back. Upon opening, it has one vertical and one flat tool holder. Behind the vertical tools is an area that fits flat things like cables and housing. Under the horizontal tools is a larger space that fits a small parts bin, cassette tools, torque wrench, rags, lubes and fluids. 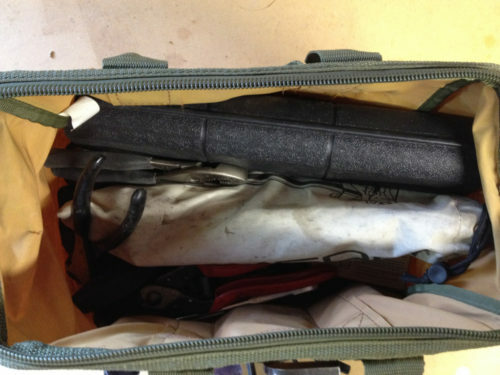 When I travel light and want fewer tools, I chuck the bare necessites into a small canvas “doctors” bag. In contrast to my station at work, my home shop is very basic. While it would be nice, a large shop space with high end audio/visual, a beer fridge and sofa is not all that necessary. I don’t hang out in my home shop. I work on my bikes at home as little as possible. The largest single expense is the workstand. That and tool storage are the biggest necessities for a shop. The actual tools may add up to a significant amount, purchase just a few at a time and your wallet will hardly notice. *These tools may be brand/model specific. Other tools as required for your bike(s). 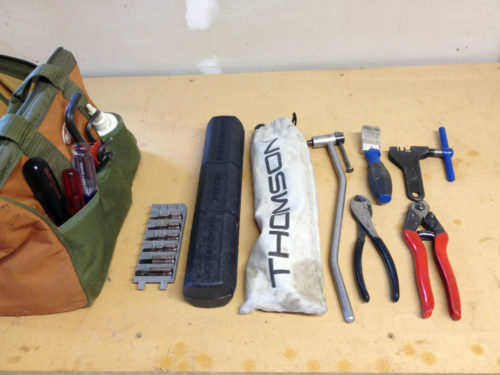 A minimal set of tools for bike repair. 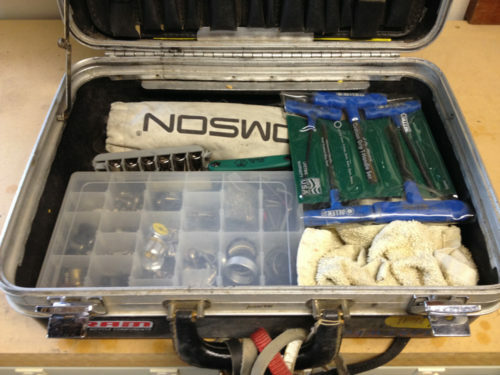 Inside the traveling tool box.